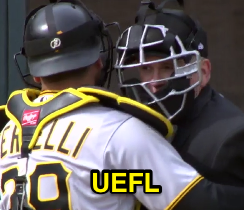 Since sustaining an Opening Day concussion on a March 30 pitch to the head that eluded catcher Francisco Cervelli's mitt, umpire Mike Everitt attempted a return after 25 days off the field, officiating several games from April 25 through May 2 before he once again disappeared from on-field service. Mike Everitt is yet to return to regular service. Unfortunately, this complication has led to a second absence that has now surpassed the 30-day threshold indicated in new-for-2018 UEFL Rule 1-5-b, which authorizes umpire replacement under certain circumstances during the regular season pertaining to extended absence. Because Everitt is a Crew Chief, there are two potential replacements that UEFL members who own Everitt may effect: that of Everitt as a Primary/Secondary umpire, and that of Everitt as a Crew Chief. If you drafted Everitt in either capacity and wish to make a replacement, read on for Rule 1-5-b's instructions. If your Crew Chief is Mike Everitt, you may select any Crew Chief listed below. If your PRM/SDR is Mike Everitt, you may select any primary/secondary umpire listed below. Everitt has zero points in Primary and Secondary classifications, and zero points in Crew Division. To effect a midseason replacement, post a comment to this announcement indicating your username, classification to be changed (Crew Chief, Primary, or Secondary), and proposed replacement name.